August was slightly below average as to the temperature and above long-term average as to the precipitation. Habitus of plants remained sharp approximately at the half of hop gardens by the end of August. Cones are smaller at the most of localities. In the first half of August the chemical protection specialized first of all to downy mildew of hops was finished. Health state of hops is very good. Majority of hop-growers started the harvest of Saaz semi-early red-bine hops from 18th - 20th of August. Harvest termination is expected on 5th - 6th of September. 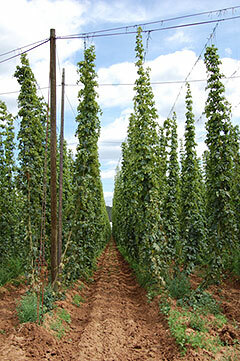 The average yield of Saaz semi-early red-bine hops is estimated. The average content of alpha acids is expected to be around 3,0 %. The enclosed photo presents the typical hop-garden state on 21th August.